We reached Margaon (Moddganv) railway station early in the morning, and then to the Anup holiday homes near Calingute beach. We had some time to refresh and breakfast, and then rush towards the beach. It was a sunny day, as we came here at the start of Feb. The day was dedicated to fun-filled water-sports and beach time. 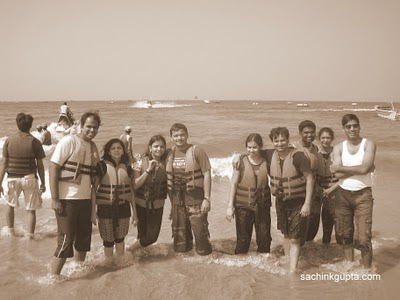 We had sea-water biking, banana ride, para-sailing etc. All the groups participated in this sporty event. First at the eve, we had a cup of cardamom and ginger tea, then walked towards a temple near the crossroads. Calangute's nightlife is surprisingly tamed and provide a nice break for party lovers. At the beach itself, We had candle-light with the whole group, and enjoyed chat with all. Beach walk at night remind me the days of Cyprus. For sometime, we shake our body, move our legs at the dance floor. After that we roam around the places to enjoy Calingute night market and have dinner. At least Zabi bought the specs for his eyes security. Now it was the time to go to bed, as another packed day was scheduled. Enjoy the next day - Trip to old Goa and Panaji. Wow, you have some great photos there. I especially like the first one of the bull. Great composition!